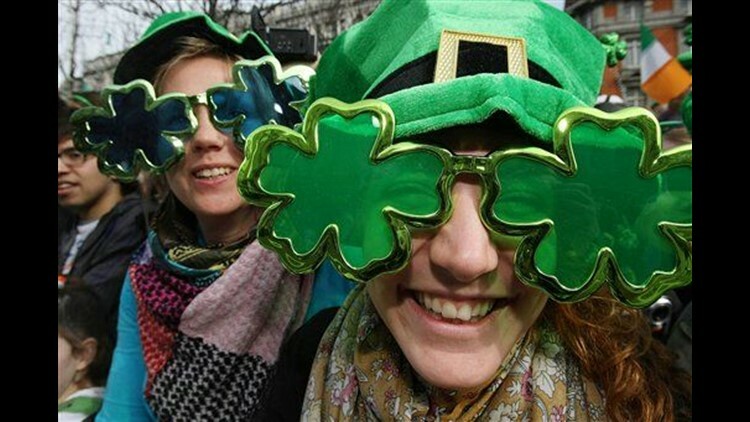 NEW YORK (AP) — Dancing Dubliners and New York City paradegoers wearing kilts and green body paint led the world in celebrating St. Patrick on Wednesday along sun-warmed parade routes in gatherings large and small. As many as a quarter-million marchers headed up Manhattan's Fifth Avenue for the world's oldest and largest St. Patrick's Day parade, just as crowds gathered along parade routes in Dublin and cities around the country to mark the emerald-hued holiday. It was a mix of lighthearted cheer and serious politics at the White House, where President Barack Obama met with Irish Prime Minister Brian Cowen. Obama noted that 36 million Americans claim Irish ancestry, adding, "I'm sure more do on St. Patrick's Day." "And it's a testament I think to how close our two countries are that America has been shaped culturally, politically, economically by the incredible contributions of Irish Americans," Obama said. In Savannah, Ga., organizers put up crowd control barricades for the first time in preparation for large numbers at the city's 186th St. Patrick's Day parade, and Columbus, Ohio, was expecting a record 121 marching groups including Irish clubs, police and fire departments, and pipe and drum bands. The day was kicked off in earnest by the more than a half-million people who lined the 2-mile route of the flagship Dublin parade, which had a theme this year celebrating the global spread of the Irish. Mixed in with the usual displays of U.S. marching bands and Irish sporting heroes were dancing troupes from Africa and India, bands from Austria and France, giant insect floats from Spain, and Dubliners dancing with mops and dusters. The holiday seemed to stand for a simultaneous celebration of spring, with many cities experiencing temperatures in the 60s after a harsh winter. The embrace of Irish heritage and culture in New York City includes bands, bagpipes and grand marshal Ray Kelly, the city's police commissioner. The 249th St. Patrick's Day extravaganza will be the last of New York City's world-famous parades to take place before new restrictions go into effect April 1 requiring all parades to be shorter to save money. John Rupy, of Harpers Ferry, W.Va., considered this news along the parade route, where he arrived dressed in a kilt with his skin painted green. "That's not good," he said, "because the whole world comes to this." The city issued the new parade rules in February. All parades must cut routes by 25 percent and reduce time to less than five hours, changes estimated to save $3.1 million in police expenses. The St. Patrick's Day parade runs about 2.1 miles from 44th Street to 86th Street and is typically a six-hour celebration. Some welcomed the idea of a pared-down event. "It'll be good because people will be able to get where they're going easier," said Yogesh Pai, of Henderson, Texas, as he navigated the crowd with his 5-year-old son. In Boston, city and state government offices were largely shuttered as locals marked Evacuation Day, commemorating a British retreat from Boston in March 1776. But because it coincides with St. Patrick's Day, it has become a controversial holiday amid the down economy as private sector employees continue trudge to their jobs. Legislative Republicans failed Tuesday in their latest effort to repeal the holiday, a move that Democratic Gov. Deval Patrick supports. While the Black Rose and other Boston Irish pubs opened as early as 6 a.m., the city was not holding a parade. That took place Sunday in South Boston, but the crowds were sharply off amid the nor'easter that lashed the region. With the sun shining and temperatures in the 60s, a large turnout was expected in New York City. Parade participants on Wednesday included the "Fighting 69th," a New York National Guard unit whose history stretches to the U.S. Civil War when immigrants made up the so-called "Irish Brigade" of the Union Army. Gov. David Paterson and Mayor Michael Bloomberg attended Mass at St. Patrick's Cathedral before the parade. Representatives of lesbian, gay, bisexual and transgender groups were not allowed to participate in the march — at least, not under their own banner. Members of the Ancient Order of Hibernians, who run the nation's biggest St. Patrick's Day celebration, say they may invite whomever they please. Bloomberg favors inclusion but still planned to participate.